'Enter Zoom' is the mind-blowing introduction of this season's big bad villain Zoom as he makes the jump to our earth and is everything Jay Garrick has said - a monster. There's a saying about poking a bear that will lead to one angry bear and Team Flash finally get their wish when Zoom comes through the breach and unsurprisingly wreaks havoc. Leading up to the riveting confrontation between speedsters, the subject of whether they should keep luring Zoom or not was the central issue. Joe as usual was the voice of caution and reason, but Barry was determined to stop the threat at the source. Joe made some good points about not being prepared to take on such a formidable enemy without knowing more about him. Barry countered with the equally reasonable desire to spare any more people from getting caught in the middle as Zoom will surely continue to send metahumans and/or King Sharks from Earth-2 to destroy him. Unfortunately, his plans to use Earth-1's Linda Park to pretend to be Dr. Light puts her squarely in more danger. The real Dr. Light made her escape from STAR Labs' prison. Why would Cisco open the pod ensuring an invisible Light would escape? I mean there's no need to open it. Anyway, with Linda-2 on the loose Linda-1 stays with Iris in hiding. What could have been an awkward pairing considering their pasts with Barry turned into an endearing bonding moment. The writers don't always know what to do with Iris but she's been more involved this season especially at STAR Labs. Although, the fact that Barry has revealed his identity to yet another person should make Iris's blood boil. In order to prepare Linda to pretend to fight Barry while dressed as Dr. Light, Cisco conceives a training course complete with cardboard cut-outs of Team Flash including goofy poses of Cisco. It turns out to be one of the funniest gags we've seen on the show. With Linda in sort-of-control of the Dr. Light suit the elaborate and dangerous ruse is ready to go. Cisco senses Harry is hiding something. Harry from Earth-2 seems overly eager to help Barry defeat Zoom with a lot of implied urgency. The second most funny gag was Cisco trying to intentionally "inadvertently" touch Harry to vibe his situation. The sobering reality after he finally does finds that Zoom has captured Harry's daughter, Jesse Chambers Wells (as in comic book speedster Jesse Quick), on Earth-2. Zoom is a beast of an opponent. Bigger, stronger, and faster with the ability to take your lightning bolt and redirect right back at you. Barry didn't stand a chance. Zoom takes the beaten and broken ragdoll of a Flash around Central City touting his supremacy. He stops at CCPD and Picture News to announce that he's beaten this world's pathetic Flash. Finally, he taunts the STAR Labs crew with Barry's unmasked face, bloody and bruised. Zoom has won this round with ease and it could mean it's going to take a team of heroes (probably from Arrow and Legends of Tomorrow) to finally defeat him this season. 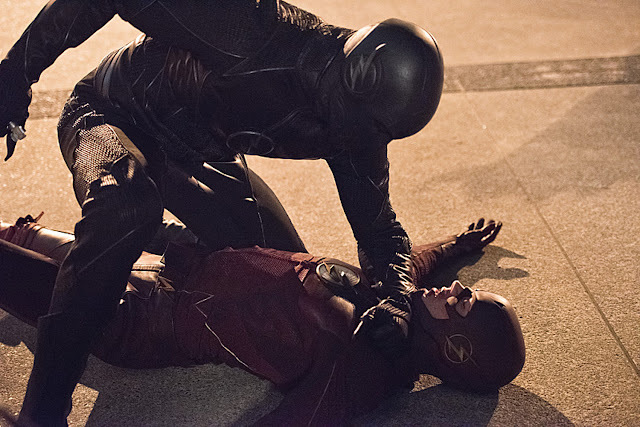 Zoom had to be a greater threat than Reverse Flash of last season. The final minutes were some of the most nail-biting moments we've seen from the show ever. So far 'The Flash' has raised the stakes for more heroes and villains in what's sure to be an epic showdown later this year. Check out the preview for the next episode "Gorilla Warfare"